Fans witnessed a spectacular night of drum corps action during the second evening of the DCI Eastern Classic in Allentown, Pa. Saturday night. Phantom Regiment members carried the show with a gold medal finish as they debuted a new ending to their program "Spartacus." Meanwhile, Carolina Crown kept things close while snagging the silver to a standing ovation, and the hometown Cadets got fans smiling and applauding to their program "…and the pursuit of happiness." A thunderous exhibition by the Bridgemen Alumni brought the crowd to its feet once more as J. Birney Crum hosted another competition for the ages. Phantom Regiment (1st, 95.825) brought a multitude of changes and additions to the finale of the corps' program tonight, including herald trumpets for the opening fanfare of the production, a helmetless finale, and one more staged death added to the aggressively theatric show. In the end, conductor Will Pitts is speared where he stands as a successor to the production's Spartacus character takes the drum major podium. Phantom Regiment tied Carolina Crown for total General Effect on Saturday while also taking first place in total Visual and total Music. Phantom Regiment executive director Rick Valenzuela had words of praise for the members' commitment to making each show count. Valenzuela said, "They love it. They've been great performers from day one, and they continue to be great at taking the stage each night. They've learned that it's not just getting up for the big shows, it's getting up for the small shows and getting up for every show … You could ask any of these performers to do a show for you by themselves, and they would go out there and do it because they just love performing. We tell them that you can't sit back and rest on your laurels. You've got to go out and really throw it down every single time, and they're really great at that." Valenzuela stressed that the focus of the corps right now is to take the final production changes and refinements one day at a time. He said, "The biggest show is tonight's show. The biggest thing tomorrow is tomorrow's run-through. Tomorrow we will get up and work on the things that didn't go right tonight. We're going to work our tails off tomorrow to clean those things up and keep putting it together because time's running out quickly. These guys understand that this is a once in a lifetime opportunity. Every Regiment show is great, but this one tops them all right now. They're setting the bar really high for next year's corps." Carolina Crown (2nd, 95.400) had the highest brass score of the evening, and remains very close to other top finishers from the Eastern Classic. The Cadets (3rd, 94.350) basked in a standing ovation from their hometown crowd tonight, and mixed things up on the judging sheets with top finishes in the Color Guard and Visual General Effect sub-captions. The Santa Clara Vanguard (4th, 91.700), Blue Stars (5th, 87.250), Crossmen (6th, 85.75), Colts (7th, 83.650), Spirit (8th, 83.450), Pacific Crest (9th, 79.275) and Pioneer (10th, 74.000) rounded out the competition. A blast from the drum corps past closed out the evening as the Bridgemen Alumni took the field for a performance of some of the corps' most beloved tunes. The Bridgemen, based in Bayonne, N.J., snagged the bronze medal at the 1980 Drum Corps International World Championships and were awarded three high percussion titles in 1980, 1981 and 1982. 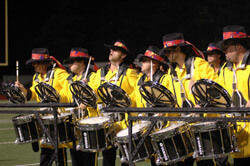 Last fielding a junior corps in 1987, the Bridgemen reappeared as an all-age corps in the 2000s. The Bridgemen's field performance included "Big Noise from Winnetka" and the theme from "Shaft," and then took to the stadium track for an encore including "In the Stone" and their signature "William Tell Overture." Louis Santiago, a percussionist for the Bridgemen, first got involved with the corps in 1974. He described the corps' performance as, "Heart-pumping. [There was] a lot of adrenaline going, and the crowd was very reactive." His fellow Bridgemen percussionist Alan Incao said, "That's why we do it. We do it for fun. Everybody's here for the same reason – for that reaction. The goal is to entertain." With both nights of the Eastern Classic using the same judging panel and officiated as if they were a single contest, the four top drum corps stand within less than a point of each other, with other closely contested races throughout the rankings. Everything will come down to next week's World Championships in Bloomington, Ind., in what promises to be yet another year for the record books!